In 1999, the PESA Explorers of Houston Committee began honoring a leading exploration and production company for technological innovation and leadership. 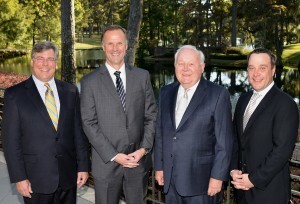 On October 26, PESA members gathered at Lakeside Country Club for the annual reception as Explorers of Houston Committee Chairman Robert Workman, President & CEO of DistributionNOW, presented this year’s award to Mewbourne Oil Company. Explorers of Houston Committee Chairman Robert Workman, President & CEO of DistributionNOW​, presented the Explorers of Houston Award for Leadership & Innovation to Mewbourne Oil’s Leadership: Curtis W. Mewbourne, Founder and Owner; Kenneth S. Waits, President and CEO; and J. Roe Buckley, Chairman of the Board and CFO. Curtis Mewbourne, Founder and Owner, Kenneth Waits, President and CEO and Roe Buckley, Chairman of the Board and CFO, accepted the award. Mewbourne attributed their success to a low cost structure and strong financials that operate within their cash flow and without debt. “We are honored to accept this award and although we have great assets, our people are our most important asset,” stated Mewbourne. Despite challenging market conditions, Mewbourne did not cut wages and benefits or lay off any employees. Additionally, by contributing to educational scholarship funds and continuing to hire recent graduates, Mewbourne further demonstrated their commitment to developing the industry’s top asset: knowledgeable and skilled people. “Even in the midst of the downturn, the technological revolution is alive and well, thanks to the service and supply companies,” said Mewbourne. Mewbourne commended the service and supply sector as the leading producer of the innovative technology that drives our industry. PESA members are proud to partner with companies like Mewbourne Oil Company as they set the stage for a strong future through technological innovation and leadership.